Working over the holidays? Here are some tips on how to be productive from home or anywhere. Scrooge thought it was a bunch of humbug for anyone to take time off during the holidays. There were customers to meet, orders to fill. Truth be told, working during holiday “vacation” is still a fact of life for many in the business world. But thanks to new videoconferencing products, being productive and in touch doesn’t mean having to be pulled away from home and family. Your company is closed for the holidays, but the core team needs to finish up one last presentation. At noon, they initiate a group video meeting with regional sales managers in 6 different locations. Everyone joins the video conversation on their laptops, smartphones or tablets from home and other holiday vacation spots. By 1 pm, the team finalizes the sales presentation. The conference ends, everyone goes back to their holiday break, and in January they hit the ground running, rested and ready to achieve their sales goals. If you get that urgent sales call from a client during the holidays, you don’t have to go into the office to hop on a high-quality videoconference. With the Logitech C930e Webcam and a computer, you can easily initiate a conference from home in enterprise-quality HD 1080p video. What’s more, the webcam’s wide field of view, pan, tilt and zoom allow you to show product demos or focus in on whiteboard notes so you can bring presentations, ideas and visual details to life—all vital to clear communication and expediting decisions and response times. Working at home during the holidays also means getting things done quickly so you can get back to spending time with family. To work seamlessly and productively from your tablet to smartphone to laptop, check out the Logitech Bluetooth® Multi-Device Keyboard K480. 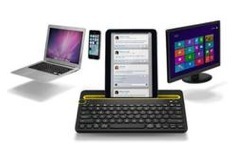 You can switch between typing on three different Bluetooth® wireless devices with a turn of a dial. Another versatile detail is a built-in cradle that holds your smartphone or tablet at a comfortable viewing angle for typing, video conferences, web browsing and more. Working on-the-go this holiday? Try our Logitech Ultrathin Keyboard for iPad to keep you efficient and mobile. With a Bluetooth® wireless keyboard and a super thin screen cover that fully protects your screen, you can focus on getting the job done so you can get back to your holiday. One of the best gifts you can give yourself, your business and your employees during the holidays is technology that helps everyone be more productive and collaborative—and have a better work-life balance. Share your tips for how you manage work during the holidays in the comments below.